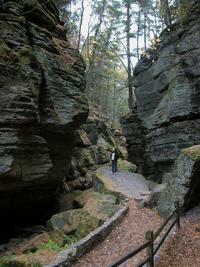 Parfrey's Glen, Baraboo, Wisconsin. Photo by Tom Schmit. I joined the Geoscience Education Web Development Team at Montana State University in 2003 as a cataloger for the digital collections associated with the On The Cutting Edge workshop series. I developed the resource collections for the Geology and Human Health workshop, Teaching About the Ocean System Using New Research Techniques: Data, Models and Visualization, and Teaching Sedimentary Geology. I continue to contribute to several other new and ongoing collections and projects. In addition to my position at On The Cutting Edge, I also do freelance editorial work. Prior to joining the Team, I was a grant administrator and project manager at the Yellowstone Park Foundation. I have also served as a teaching assistant for courses in introductory physical geology, sedimentary petrology, and structural geology. I look forward to continuing my career in geoscience education with further opportunities for involvement in science writing, outreach, and hands-on education. Millner, J.R., Kirk, K.B., Mogk, D.W., 2004, Web-Based Resources for Teaching Geology and Human Health: Geological Society of America Abstracts with Programs, Vol. 36, No. 5, p. 126.